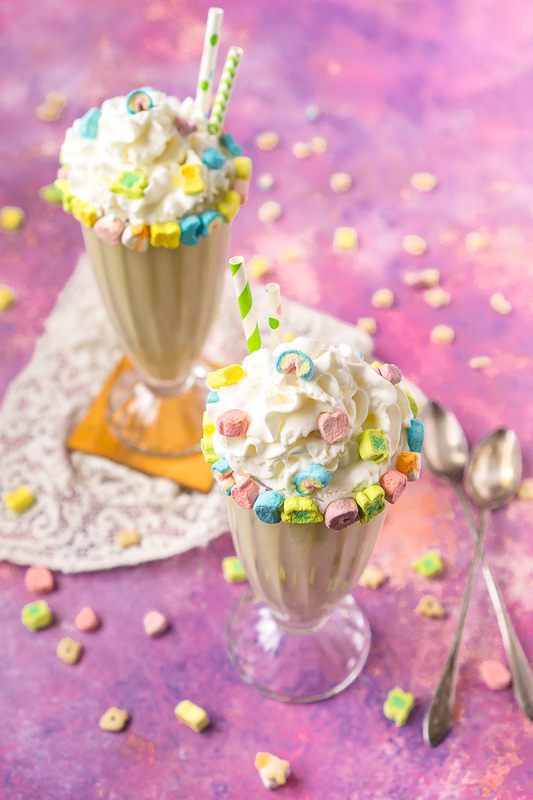 Lucky Charms recipes are perfect kid friendly recipes for St. Patrick’s Day, especially this Lucky Charms Milkshake! Fun, colorful, and sweet – this milkshake recipe will be slurped up right before your eyes! Blend Up this Sweet Lucky Charms Milkshake Recipe for St. Patrick’s Day! Lucky Charms cereal is a rare treat in this house for breakfast. It’s a little sweet for my daily breakfast; we tend to be a Honey Nut Cheerio household over here. I can’t say no to an occasioanl bowl though and I definitely can’t say no to recipes using Lucky Charms. 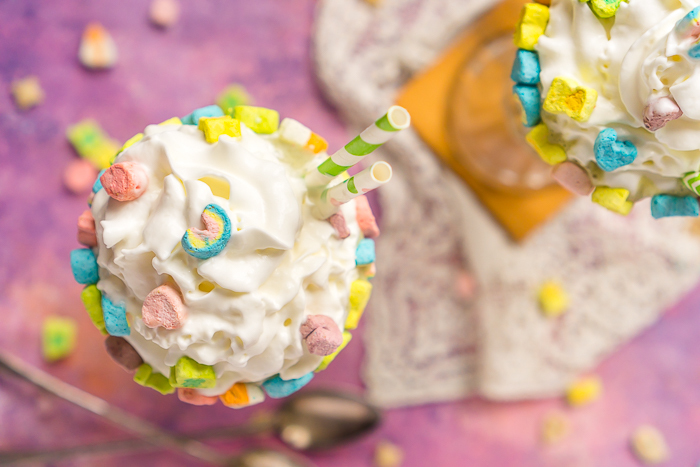 They’re perfectly sweet for dessert recipes like Lucky Charm Puppy Chow and this Lucky Charms Milkshake! I mean, who can say no to those marshmallows?! So many recipes for St. Patrick’s Day are alcohol related, which I’m not entirely opposed to. My Guinness French Onion Soup is my husband’s favorite. However, with a kid in the house now, finding kid friendly recipes for holidays has became more important. I want him to be able to join in on the fun as well! Bryan and I already have our favorite St. Patrick’s Day Boozy Milkshake which is a Mint Chocolate Mudslide with Bailey’s and Kahlua, so I thought a non alcoholic milkshake for Liam was in order. Thus this Lucky Charms Milkshake! With vanilla ice cream, Lucky Charms cereal, milk and some colorful sprinkles for extra color, you are going to make it the sweetest St. Patrick’s Day! Are You Ready to Start Sipping on this Sweet St. Patrick’s Day Milkshake?! 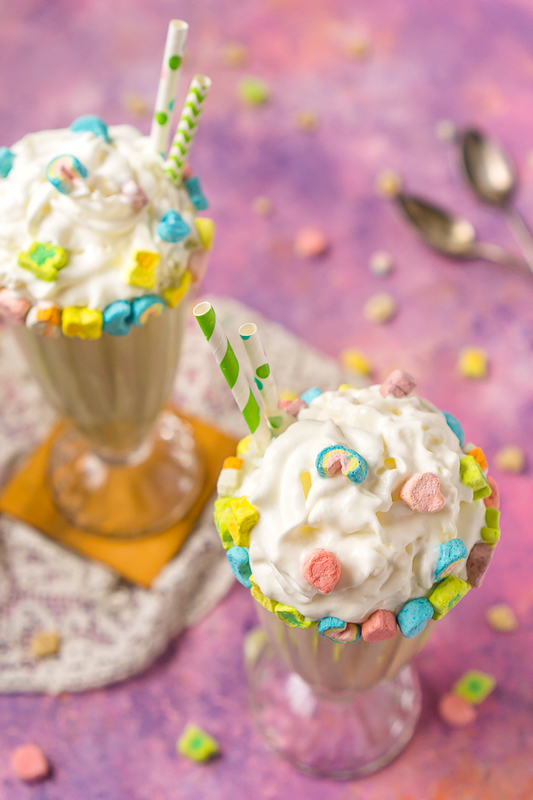 Made with vanilla ice cream, Lucky Charms cereal, Lucky Charms marshmallows, milk and sprinkles, this Lucky Charms Milkshake is a kid friendly St. Patrick's Day recipe the whole family will love! Add all your ingredients to the blender. Blend until smooth and enjoy! Note: For a thinner milkshake, add more milk. For a thicker milkshake, add more ice cream.